Arvol Looking Horse is the 19th generation keeper of the White Buffalo Calf Pipe Bundle and holds the responsibility of spiritual leader among the Lakota, Dakota and Nakota People. He holds an honorary Doctorate from the University of South Dakota, and travels and speaks extensively on peace, environmental and native rights issues. Chief Looking Horse’s prayers have opened numerous sessions of the United Nations and his many awards include the Juliet Hollister Award from the Temple of Understanding, a Non-­‐Governmental Organization with Consultation Status with the United Nations Economic and Social Council. He has been the recipient of several awards, including the Wolf Award of Canada, The Forgiveness Award, and the United Nations Juliet Hollister Temple of Understanding Award for his dedicated work for peace. Since 1996 Arvol Looking Horse has been calling for a unified global day of peace known as World Peace and Prayer Day/Honoring Sacred Sites Day on the 21st of June of every year. He lives on the Cheyenne River Reservation in South Dakota. Tata Pedro Cruz who’s Maya name is K’u’x’ya meaning Heart of the Lake, is one of the last living Tzutujil Mayan elders of Lago Atitlán Guatemala. He is a member of the Council of Mayan Elders of Guatemala and 2005 World Peace Ambassador. He has been working to bring together surrounding Maya from neighboring villages to hold ceremony with one another. He started holding a gathering of elders and young Maya from all over Guatemala and traveling to Tikal where he has been holding ceremonies in Tikal at the main Jaguar courtyard for the December 21 winter solstice for the past 6 years and will continue to do so until December 21, 2012. Phil Lane Jr. is a member of the Yankton Sioux and Chickasaw Nations. For more than 44 years Phil has been working with Indigenous Peoples from North, Central and South America, Micronesia, SE Asia, India, Hawaii and Africa. In 1970‐1971 Phil worked with Indigenous Peoples in Bolivia. It was here where he began his life‐long dedication, with other Indigenous Peoples, toward actualizing the Reunion of the Condor and the Eagle. 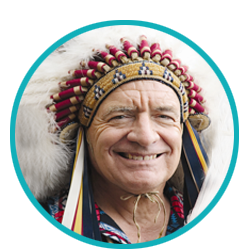 Phil served 16 years as Associate Professor in Indigenous Education at the University of Lethbridge, where, in 1982, Phil Co-founded, with Elders from across North America, the Four Worlds International Institute (FWII). With the guidance of the Four Worlds Elders Council and Phil’s leadership and applied experience, FWII has become an internationally recognized leader in human, community and organizational development because of the Institute’s unique focus on the importance of culture and spirituality in all dimensions of development. In 1977, Phil was named a Modern Indian Sports Great by the National Indian Magazine, Wassaja, for his record‐breaking accomplishments in Track and Wrestling. He has extensive experience in his own cultural traditions, is an award winning author and film producer and holds Master’s Degrees in Education and Public Administration. His film credits include the National PBS series “Images of Indians” with the late Will Sampson, “Walking With Grandfather”, “The Honor of All: The Story of Alkali Lake” and “Healing the Hurt” the first documentary to bring to public attention Canada’s infamous Residential School System’s intergenerational physical, emotional, cultural, mental, and sexual abuse of more than 150,000 aboriginal children across Canada. In August, 1992, Phil was the first Indigenous person to win the prestigious Windstar Award, presented annually by the late John Denver and the Windstar Foundation to “a global citizen whose personal and professional life exemplifies commitment to a global perspective, operates with awareness of the spiritual dimension of human existence and demonstrates concrete actions of the benefit for humans and all living systems of the Earth.” At this International event, in recognition of his hereditary lineage and long time service to Indigenous Peoples and the Human Family, Indigenous Elders from across North America recognized Phil as a Hereditary Chief through a Traditional Chiefs Headdress Ceremony and Elders Honor Dance. Other winners of these international awards include, Oceanologist Jacques-­‐Yves Cousteau, David Brower, Yevgeni Velikhov, Vice President of the Soviet Academy of Sciences, Wangari Maathai, Nobel Peace Prize Winner and founder of Kenya’s Greenbelt Movement, Lester Brown, President of the World Watch Institute, the Dalai Lama of Tibet, Dr. Boutros Boutros Ghali, former Secretary General of the United Nations, and British Lord Yehudi Menuhin, musician and philosopher. Since 2007 FWII’s work has included a special focus on utilizing digital communications technologies for developing “Deep Social Networks and the Digital Fourth Way’’. The focus of The Fourth Way is contributing to the unification of the Human Family by co-­‐creating community-­‐based, culturally-­‐respectful, principal-­‐ centered strategies and programming that transcends assimilation, resignation, and conflict. The Fourth Way is guided by the Four Worlds Principles for Co-­‐Creating A Sustainable and Harmonious World developed through a Consultation Process with Indigenous Peoples across the Americas. 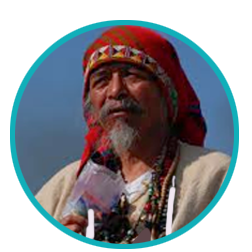 These principle-centered, collaboratively created and community-based digital networks purpose includes: uplifting education, sustainable development, child protection and social justice with Indigenous Peoples and other members of the Human Family in the Americas, South East Asia and Beyond. This Work with Deep Social Networks with Indigenous Peoples in SE Asia Central is briefly highlighted in Creating 4th Way DSNS With Indigenous Peoples in SE ASIA Central to this global work is the establishment of an Indigenous digital communications and educational initiative at the Ciudad Del Saber in Panama City, Panama in 2012 for implementing the Fourth Way and the Reunion of the Condor and the Eagle across the Americas and beyond. 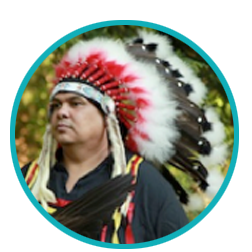 Rueben George, Tsleil-­‐Waututh Nation, Director of Community Development, is an Indigenous community organizer and spiritual leader. 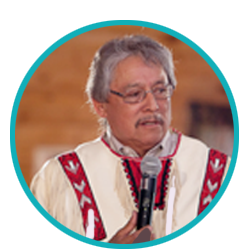 He is a Sun Dance Chief and the grandson of Chief Dan George, the Oscar nominated and universally respected First Nations Spiritual leader. Rueben started his career by founding creating Dukes Youth Healing Centre 19 years ago. Rueben learned very quickly that the foundation for his success in his work would be his culture and spirituality. Rueben’s Grandfather taught him “anything you learn in college or university on healing there is a First Nation teaching that says the same thing.” Based on the teachings of his Elders Rueben created a reference library of successful psychological healing programs and translated them into First Nation’s culture and spirituality. As well as being a Sundance Chief Pipe Carrier and Sweat Lodge leader Rueben is an active participant in his Coast Salish Winter Spirit Dancing Ceremony. Rueben has worked across Canada and the United States facilitating workshops on healing and wellness. In every project Rueben works on he is sure to incorporate his culture and spirituality. In his present position as Director of Community Development for the Tsliel Waututh Nation Rueben oversees the Education, Social Services, Employment and Training, Youth and Elders programs, Family Support Programs and the Tsliel Waututh Nation Daycare and Early Childhood Learning Centre. Chief Rueben assures that the foundation of all community development programs are Tsliel Waututh Nation culture and spirituality. Dave Courchene – Nii Gaani Aki Innini (Leading Earth Man) has travelled internationally, carrying a message of hope and peace. Dave shares ancient Indigenous knowledge that he believes can act as the foundation in supporting the New Life that Mother Earth is now entering, and that the Elders have confirmed has arrived. He has created a special place for sharing ancient Indigenous knowledge – the Turtle Lodge – built based on a vision he received many years ago. Indigenous people have always relied on visions and dreams to give guidance and direction in life. Dave was recently honoured by Indigenous leaders and Elders at the 2010 International Indigenous Leadership Gathering, and with a National Aboriginal Achievement Award (2012) and the Volunteer Manitoba Award for Outstanding Community Leadership (2012), for the work associated with his message and vision, including the work he has done inspiring young people. 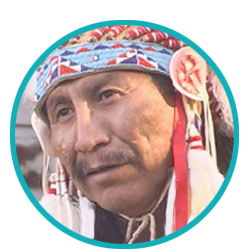 His recent work has involved initiating International Roundtables Supporting Ancient Indigenous Knowledge at the Turtle Lodge (May 2010) and the US Capitol Building in Washington, DC (September 2010), which have been co-led by US Congressman Dennis Kucinich. He delivered the Opening Keynote and conducted the Opening Ceremonies at the 2010 G8 Summit on World Religions. In 2011, Dave shared the stage twice with the Dalai Lama to bring a message of peace in Newark, New Jersey and Monterrey, Mexico. In the Spring of 2011, Dave initiated the Makoose Ka Win and the Vision Quest rites of passage to take young people of all cultures entering Adulthood back to the land and the Elders to find their uniqueness and promote peace. A modern elder. Helen Samuels is among a rare group of innovative and courageous social entrepreneurs who are changing the way the world views solutions to our environmental and social challenges. With dogged determination, compassionate action and hands-­‐on grassroots organizing, Helen, an ASHOKA Fellow, has spent more than 30 years and visited over 25 countries inspiring and supporting youth with projects mainly in Mexico and the United States. Devoted particularly to fostering self-­‐generated solutions to the poverty and social devastation in and around urban settlements and rural areas. Her passion particularly extends to the “4th SECTOR” -the massive and fastest growing social sector of urban youth worldwide who are struggling with the day to day survival facing the challenges of POST – Development. Traditionally national development strategies all too often do not consider the youth as stakeholders and active promoters of their own well-­‐being. In order to advance, the youth must invent their own future and Helen is there to hand them the tools. Her dedicated efforts have lead to the creation of more than 150 youth-­‐run projects which have hence spawned an additional 500 community based projects themselves as they have replicated their sustainable practices through other local and global networks. In the last 20 years Helen has also committed to facilitating events that promote the protection and restoration of traditional native cultures and the promotion of sustainability practices with the . Helen facilitates projects generated by youth leaders who strive to offer their community an answer to poverty, violence, ,environmental collapse, despair and crime. 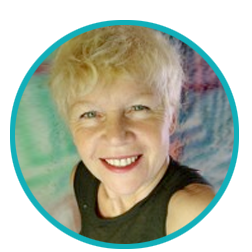 She is creating an extensive support network of adult and youth mentors to inspire and train the youth in alternative technologies and sustainable practices while inculcating a philosophy of living with respect and in balance with Earth’s life supporting systems. Helen and her network of caring adults have worked alongside the youth to enable their productive efforts as they craft a sustainable future. Helen has altered the way the media, decision-­‐makers, and others perceive urban and native youth cultures, as well as the way the youth perceive themselves. Examples of Helen’s leadership in the international scene includes the co-­‐creation of “Earth Crew” with Los Angeles based Graffiti artists & “Urban Courage,” a coalition of youth from gangs who became the first to present innovative community improvement projects with the perspective of urban youth at the 1992 Earth Summit in Rio de Janeiro, the Global Forum in Manchester as well as participation in the New York PREPCOMs and Habitat II conference in Istanbul. Urban Courage won three 1st place awards for “Youth Best Practices” and was invited by the United Nations Youth Unit to attend the World Youth Forum in Vienna, where they received a grant from Japan to create a community youth center in Mexico City. In recent years, her community-­‐building activities have resulted in the creation and replication of “Green Dome Projects” -a consortium of environmental groups from the U.S. and Mexico which was launched in 2004 with the collaboration and support of Hanne Strong and the Manitou Foundation in Colorado. The first Green Dome EXPO and was featured at the EDC Sponsored Youth Employment Summit in Veracruz, Mexico. In 2006, the Green Dome Project was a co-creator of the Alternative World Water Forum in Mexico City along with GYAN-­‐Mexico, Tierra Viva and Organi-K.